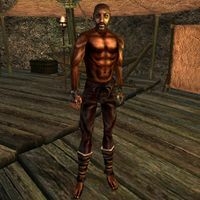 Jon Hawker is a Redguard trader who can be found in Nammu, where he is being held prisoner by Galmis Dren. Jon needs a scroll of divine intervention for his escape, leaving you with some powerful magic gloves as reward, Zenithar's Warning and Zenithar's Wiles. After he leaves, you will find out who he really was. This page was last modified on 20 October 2013, at 19:12.